Mix all dressing ingredients in a jar and give it a good shake. In a small skillet melt butter and oil together over medium high heat. Add garlic and cook, stirring fairly constantly, until lightly browned. It takes only a minute or two. Don’t burn, it will taste bitter. We know this because we did it the first time!! Remove garlic to paper towels and salt lightly. Add almonds to the same skillet and sauté until lightly browned. Remove to the same paper towels. Add bread cubes to the same skillet (add more oil if needed). Stir to coat all sides. Add oregano and lightly toast croutons. Remove to paper towels. Cut a heart shaped piece from each beet and hearts of palm slice with a cookie cutter or free form (it’s the thought that counts). 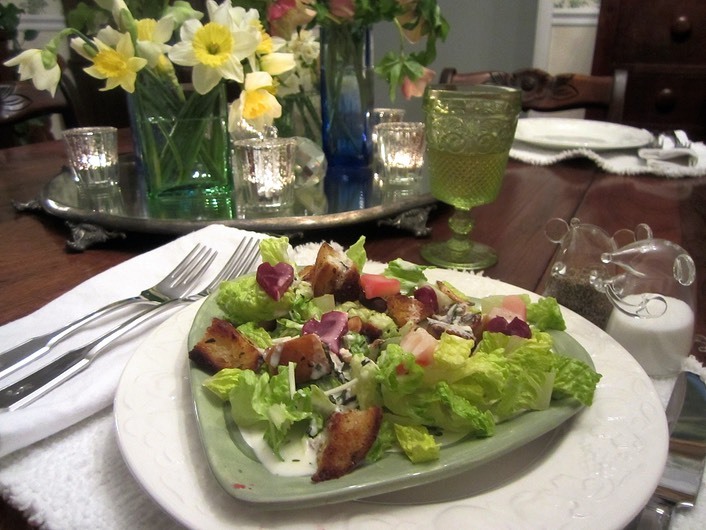 Put Romaine lettuce on individual serving plates. Top with dressing. Add croutons, garlic, and almonds. Arrange beets and hearts of palm on top. It IS adorable – go enjoy!